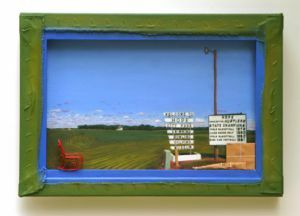 Recurring images of furniture and various utilitarian objects are symbols and signs from my own personal vocabulary of memories used to create visual narratives on wood, canvas or embossed paper. 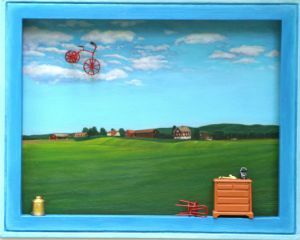 Small mixed media wall paintings with miniature tables and chairs include subtle clues to the tension and drama that lies underneath family life. I make storyboard-like scenes of family stories told with furniture in different modes. The assembled installations are constructs—part theater, part game board—that play with notions of self-identification and dialogue, in which I use art as a framing device. Participants seated in a circle in an interactive installation Conversations with the Rose Petal Rug were invited to talk about their memories of family matters. 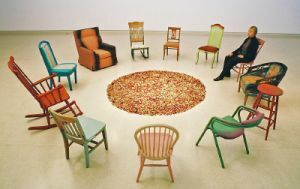 Fragments of photographs of various family members are “woven” with rose petals in the rose petal rug in the center of the circle of painted chairs to stimulate conversation about memory and loss. I use art as a tool for conversation and interaction about loss—the loss of a person or of an experience. Since 1981, Janice DeLoof exhibited throughout the United States in numerous solo and group exhibitions. Many articles and reviews have been written about her artwork in California publications, including Artweek, ArtScene, Long Beach Press Telegram, Los Angeles Times, Orange County Register, San Francisco Examiner and Visions Art Quarterly. DeLoof taught at such institutions as California State University, Fullerton; Cerritos College; Fullerton College; and University of California, Irvine. She also curated the Art Heals/Art Works exhibitions on view at the Fullerton Museum Center, Palos Verdes Art Center and I-5 Gallery at the Brewery Art Colony in 2001-2002. She was a founding Board member and an Advisory Board member for the Fullerton School District’s All the Arts for All the Kids Foundation in California. As an art education and mental health advocate, DeLoof worked to reduce the stigma of mental illness by creating and exhibiting artwork and facilitating art workshops that deal with mental health issues. DeLoof was a past Board member of Southern California Women’s Caucus for Art (SCWCA) and served as the Exhibition Coordinator when the 1999 national Women’s Caucus for Art conference took place in Los Angeles. 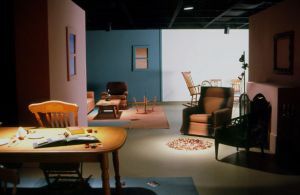 A photo of her interactive installation of two large paintings and two chairs, entitled Who Are You?, was featured on the home page of the SCWCA website until 2011. Janice DeLoof (1938-2013) is a legacy member of the Artist Registry.